Migrant workers from South Asia are dying in their hundreds to prepare for the 2022 World Cup. 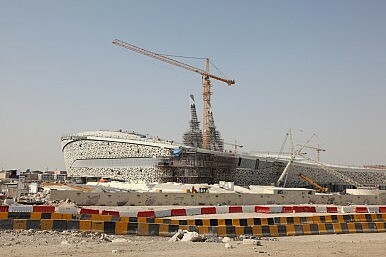 Is FIFA being shamed sufficiently to seriously consider moving the 2022 World Cup out of Qatar? Don’t bet on it, though the recent admission by FIFA boss Sepp Blatter that awarding the World Cup to Qatar was “a mistake” has renewed focus on the small Gulf state’s attempt to host the world’s premier sporting event. FIFA was quick to “clarify” Blatter’s remarks, saying the president’s comment only pertained to weather. With Qatar’s inhospitable summer temperatures, the governing body likely will have no choice but to move the event to the winter, igniting a backlash from players and fans as well as sponsors and broadcast partners. But the weather is the least of the problems with Qatar. Hundreds of migrant workers from South Asia have already died while building infrastructure projects associated with the World Cup. And the event is still at least eight years away; at this rate, some 4,000 are expected to be dead by the time the event is held. While Qatar’s leaders have pledged to improve working conditions, there’s little doubt that thousands more will die should the Cup be held in Qatar as scheduled. The inhumane abuse of the workers is largely a result of the country’s kafala system, where the employers are allowed to confiscate a migrant worker’s passport as soon as he arrives in the country. Essentially these workers – primarily from India, Pakistan and Nepal – are reduced to nothing more than modern-day slaves, since employers may choose to withhold their wages as well. Of the 1.9 million people in Qatar, only about 280,000 are citizens. The rest are foreigners – primarily workers who are brought in to perform the backbreaking job of building the country’s glitzy infrastructure funded by its oil riches. Their numbers have only swelled after Qatar won the questionable bid to host the World Cup in December 2010. At the time, Blatter lauded the decision to award the event to a Middle Eastern and Arab country for the first time. Now he’s pointing the finger at French and German interests that pushed the vote in favor of Qatar over the United States. Because of their commercial ties to the Gulf state, Blatter claimed that the European giants steered the executive committee’s final vote. Blatter stopped short of saying Qatar had bought the Cup, though there’s an ongoing investigation, headed by American lawyer Michael Garcia, on just how the country won the bid. FIFA has urged Garcia to wrap up his report before this summer’s World Cup in Brazil – scheduled to begin on June 12 – though Garcia is under no obligation to do so. There are other issues with Qatar that should have rendered it unfit to host the world’s most popular sporting event. Sharia law is enforced, though allegedly it applies only to Muslims. While the country is considered more progressive in terms of women’s rights and gay rights, that’s only in contrast with the Arab states surrounding it. Freedom of religion is nominally tolerated. But just what exactly was Blatter trying to accomplish with his latest statements? He clearly did not misspeak, despite FIFA’s attempt to “clarify” his remarks. At the very least, he’s trying to distance himself from the Qatar decision, which has been a debacle. Blatter is up for reelection as the FIFA boss in 2015 and, since he has no intention of stepping down, it is perhaps just his way of kicking off his campaign. There is almost no risk for him to condemn the Qatar decision at this point. Even if he wins another term as FIFA president next year, he will not be presiding over the 2022 World Cup, no matter where it’s held. And if the World Cup does get moved because Garcia is able to prove that bribery swayed the 2022 vote, Blatter would claim that he’s not tainted by the entire affair. Regardless of the political maneuvering, the impending Qatar catastrophe is still on Blatter, unless he can demonstrate some semblance of leadership by forcibly moving the Cup from Qatar.